Pumpkin seeds saved from your Halloween pumpkins can be roasted in your oven with salt, other seasonings, and olive oil. These make a delicious and portable snack that can be perfect for an evening outdoors. You could consider giving your pumpkin seeds a little something extra with the addition of some chilli or other warming spices, to keep you warm when outdoors this bonfire night. A range of polytunnel vegetables, thinly sliced, can also be roasted in your oven to make a healthy yet delicious snack. Consider bringing some vegetable crisps outdoors when you and your family or friends are enjoying the evening of fireworks and festivities. Kale, carrots, beetroot, parsnips and more can all make delicious vegetable crisps and, as with the pumpkin seeds, you can flavour these with a wide range of different herbs or spices. A mug of warming soup could also be wonderful for bonfire night sustenance. There are almost endless seasonal soup recipes that you can make using polytunnel produce throughout the whole year. 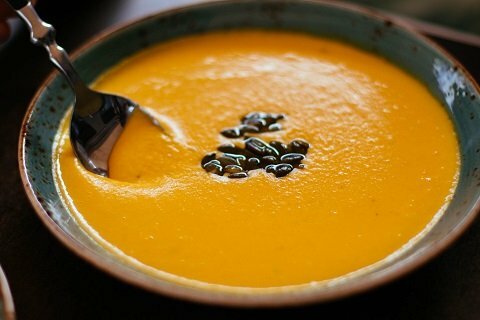 This November, if you have grown some winter squash in your polytunnel, you could consider making a spicy squash soup to warm everyone up while you are out after dark. Another warming soup that you could consider this bonfire night is a curried carrot concoction, which uses carrots from your polytunnel, along with garlic, lemongrass, chilli peppers and coconut milk. While you are not likely to be growing your own coconuts, you may well have been able to grow all the other ingredients for this Thai curry inspired soup in your polytunnel. One of the good things about making your own soups is that you can make them to suit your own and your family or friends’ tastes. Make this soup as hot or as mild as you like. If you fancy making something else to snack on alongside your soups, you could also consider making some focaccia breadsticks, which are easy to transport outdoors when you are enjoying bonfire night. Focaccia baked with olive oil, and perhaps some tomatoes and herbs from your polytunnel, are another lovely November savoury treat idea for bonfire night. What savoury treats will you serve this bonfire night? Let us know of any suggestions that you may have in the comments below.